Our company, MU Company Ltd., has been established on 20th January, 1983 and has been maintaining young energy within both our physical body and corporate structure as a manufacturer of devices for treating industrial exhaust-gas and wastewater, a unique company pursuing for technology oriented target. Principal theory related to static liquid mixer (Trade Name: MU Mixer) has been invented by Mr. Hisao Kojima, the founder of the company and presently the representative director and president of MU Company Ltd. through his meditation on white bubbles of water falls of NACHI. Patent rights have been awarded to him, not only in Japan, but in such countries as USA, China, Czech and India. 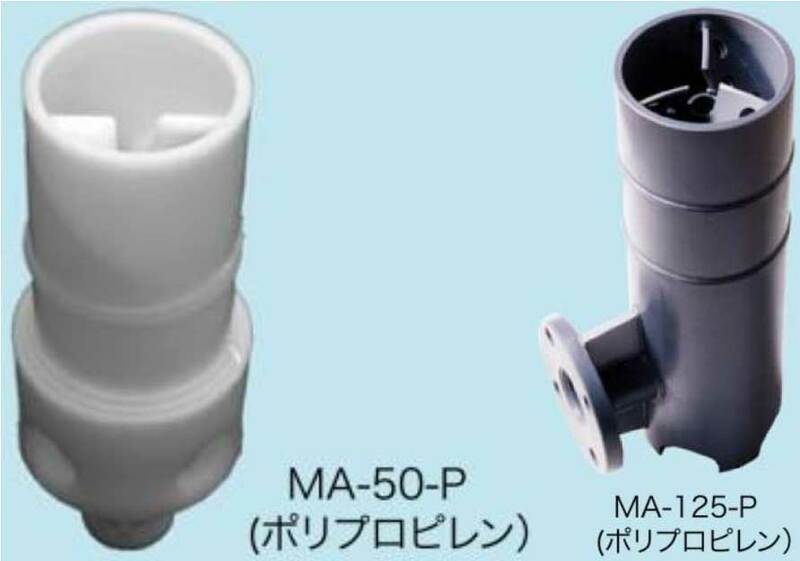 For more than a quarter century, MU Company has put their very best effort on various cases to apply the invented Static Mixing Technology to various devices related to exhaust gas and wastewater treatments. Thanks to cordial consideration and advices given by many customers, we have succeeded in supplying a number of our devices, such as Scrubber, Reactor, Aerator, Mixer etc. Among our devices mentioned before, MU Scrubber and MU Reactor are at present our major apparatus, enjoying high reputation on its excellent performance, maintenance-free and energy-saving characters. At the moment, chemical industry and electronics materials industry are our major customers. It is understood that one of the most serious headaches at present in the manufacturing industries is “maintenance jobs of various plant and machinery”. Its expenses have been increased in huge amount day by day, furthermore, securing labor forces for maintenance jobs becomes difficult in spite of paying reasonable amount of money. Under these circumstances, the merit of our technology, i.e. space saving and maintenance-free, helps to reduce maintenance and cleaning fees on production facilities to substantially zero. We are sure that such merits which our devices have demonstrated will be recognized by many people who are facing with similar troubles. Our present target is to develop and expand, based on our success in the area of industries, our applications to other fields, to contribute to maintenance and preservation of our Earth. We really consider this should be our company’s real target. 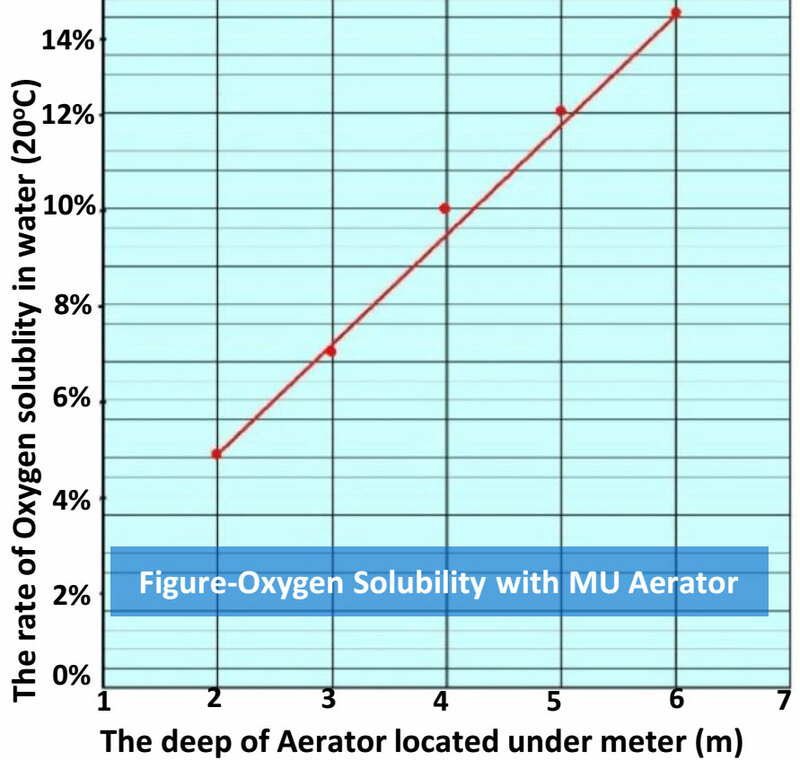 “MU Aerator” is a static mixer, downscaled “MU Green Reactor”, and has the same principles and functions as the Reactor basically. 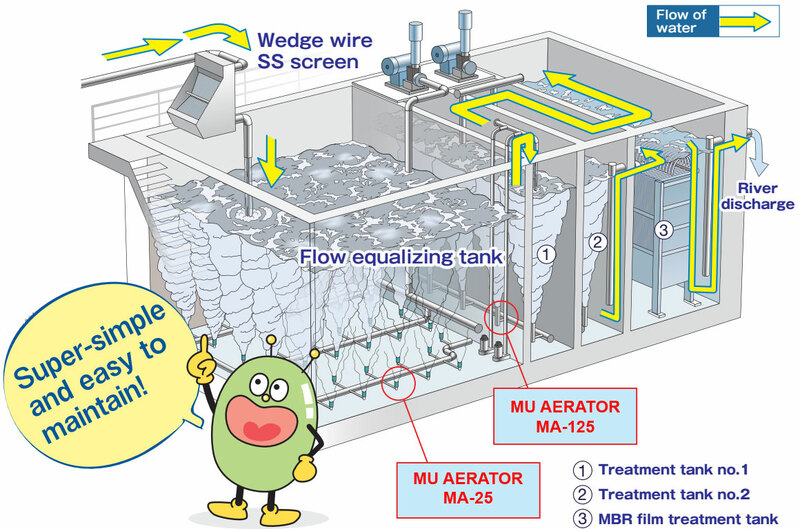 “MU Mixer”and "MU Oscillator" can produce micro bubbles and circulation flows to feed oxygen in water efficiently. The Aerator cut down more than 20% of running cost and zero of maintenance cost and, furthermore, 80% of initial cost. This means that it can save total cost remarkably. 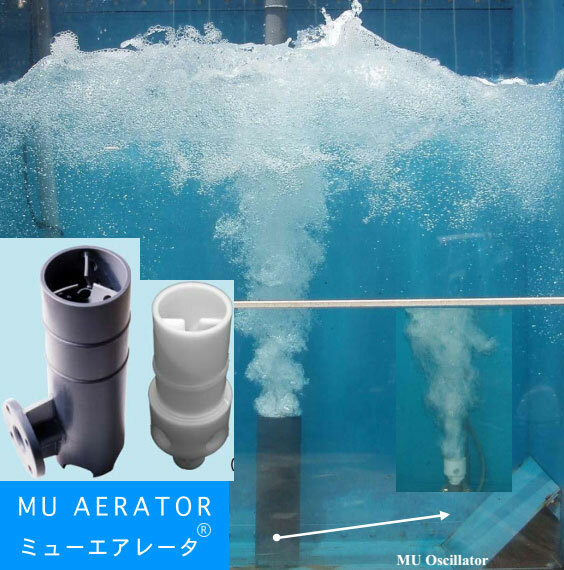 The principle and function of MU Aerator is the same as the Reactor, but the capacity greatly differs. MU Aerator has three kinds in nozzle hole diameter: 3/8B(10A), 1/2B(15A), 1B(25A). The blast volume of the largest is 2.0 m3/min, the possible stirring dimensions 7.0 m2, and depth of aeration tank 1.5m. MU Aerator can produce micro bubbles without air-liquid phase mixing pumps and pressure pumps, like MU Green Reactor, and its void fraction is four-to-six-folds than conventional static mixers. Less needed pumps means less energy is needed to generate such bubbles. The bubbles it forms are micro bubbles which cannot be generated by other static mixers equivalent to the this products in size and the bubbles can feed oxygen in water more efficiently than normal bubbles. (click this for “features of micro bubbles”) As a result, the efficiency of aeration is higher and its running cost is less 20% than that of diffusion plates. The structure of MU Aerator is, in principle, the same as that of MU Green Reactor and has no moving part. So it doesn’t need to replace any parts for galling or fixing of moving parts. Non-metallic materials keep it no rust. No replacement of any parts is need, thanks to its connection to a pipe by screwing and with no bolts and nuts. No clogging results from the large size of diameter, more than 10mm, of air jet nozzle. These factors can keep its maintenance cost free. The three factors hold the price of this product down. First, no complicated piping is installed, normally used for aeration devices with mixing pumps or diffusion plates. Aeration equipment with mixing and pressure pumps or diffusion plates needs much more additional cost than static mixers. For example, material costs for steel frame to fix the structure of piping, assembling costs for the steel frame, painting costs for the frame not to go rusty, placing and fixing costs of steel frame on the concrete floor and others. Any additional costs like these aren’t needed for MU Aerator. Second benefit is that the structure of this product is thoroughly simplified. MU Reactor is consisted of MU Mixer and MU Oscillators. The mouth of inlet is an external thread and set to be screwed to piping for conveying compressed air. Two components are made not by assembling parts, but by single molding. One of the benefits for single molding is that it can save assembling cost. The other benefit of single molding is that there is no need to reinforce the joint parts, assemble them and fill the gap between the joints. Normally the junction is weaker than other parts and therefore needed to be reinforced. Reinforcement is one factor for additional costs. The exhaustive simplification and waste cutting are another factor of low price. Third, downsizing by high efficiency is one of important factors which can save price. Circulation flow and remarkable efficient generation of micro bubbles help feeding oxygen in aeration tank highly economically. This reduced its size and production cost. These combined factors hold down the price of MU Aerator about 80% less than those of typical static mixers. Traditional static mixers make the fluid flow spiral along the blades. MU Mixer, on the other hands, can produce the two different flows; the fluid goes straight in the central hole in an axial direction and the other flows spirally along punching metal blades. Two have different velocities and directions, causing shearing on the boundary of the flows. The shearing also make the fluid broken up into smaller bubbles or segments, which leads to the increase of the air-water interface and, therefore, enhance the efficiency of aeration. MU Oscillator is a static mixer that can make air rotate, sheared and flow spiral strongly. Attached on nozzles, it can also put out air into water upward at the speed over 10 m/s. Inside the device are set two blades twisted 90 degrees and on the center is small circular room. Pressurized air injected from the nozzles is to be divided into two flows, as MU Mixer is: the spiral flow along the blades and straight flow passing through the central hole in an axis direction. The two different flows make air vibrated. The effect of air-vibration is mainly to enhance the speed of breaking up air and the following four factors cause air vibrated. Injecting compressed air into water with high speed produces turbulent flow and then the flow implodes. Injected compressed air generates sound wave with frequency of around 200-1000 Hertz by self-excited vibration. “Self-excited vibration” means that　when an object or system is vibrating, the vibration itself makes the vibrated more sensitive to outer force and the force amplifies or keeps the vibration. The injected air with high speed makes the air pressure itself low, causing cavitation. The Oscillator divides the single flow of pressurized air into two: the straight and spiral flow. The difference of velocities and direction between the two flows produces shearing force. One of the features for the product is to generate strong circulatory flow and to supply oxygen into the whole tank of water efficiently. Typical micro bubble generators fail to provide such strong flow as that of this product and aerate only smaller range of water. So larger or more devices would be needed to cover the whole water in tank. But only one MU Green Reactor can provide the strong stream enough to cover all the water in tank. The circulation flow can cover more water to aerate and enhances the aeration speed and energy efficiency significantly.